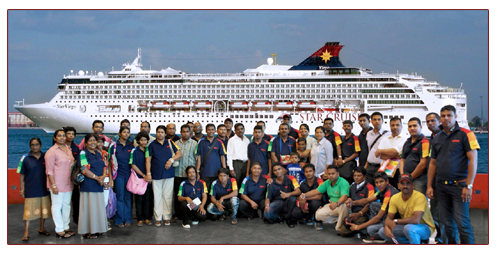 Multilac, the leading paint manufacturer in Sri Lanka, treated 63 winners of the ‘Multilac Luxury Cruise Sawari’ to a luxury cruise to the exotic destinations of Bangkok, Malaysia and Singapore. The lucky winners of the Xmas 2011 and April New Year 2012 ‘Multilac Luxury Cruise Sawari’ promotion enjoyed a 3 night/4 day trip from 26th to 29th August 2012. Each of the 63 winners availed of an all-expense paid luxury cruise including all meals. In addition, Multilac awarded Singapore dollars 250 to each winner for shopping in Singapore! The exciting trip commenced on 26th August 2012 when the winners flew to Singapore, where the trip began with a shopping expedition and a scrumptious lunch. The same day the group boarded the cruise ship which plied first to Bangkok and then Malaysia, returning to Singapore on the 29th August 2012. The customers also enjoyed shopping in Bangkok and Malaysia, discovering attractive deals for toys, chocolates and electrical items. They also had the exciting opportunity to go sight-seeing in Phuket, Singapore and Langkawi. Apart from the fun the winners had in the exotic locations, there was much to do onboard the luxury cruise liner, which had abundant recreational options including games, mini cinema, magic shows and gala dinners featuring a wide variety of global cuisine. The ‘Multilac Luxury Cruise Sawari’ promotion was an excellent opportunity to bring Multilac and its loyal customers closer together. The company has always taken pride in its strong association with its customers across the island. It will persevere with attractive promotions such as this to connect with its customers. Multilac is a manufacturer of world-class paints and surface solutions, consistently maintaining a strong edge in environmental friendly and internationally accepted quality standards. Multilac products are sold in local and global markets such as India, Maldives, Pakistan and the Middle East. Multilac has strived to bring innovation to the forefront when developing surface solutions. Among the company’s innovative breakthrough products are the Multilac Waterproofing Sealer and the Non Yellowing Brilliant white enamel paints that fight against discoloration. Multilac has introduced six new value additions to its range - further strengthening its status as the first choice for paints. This premium range (Platinum life style) adds greater value through innovative finishes. The most preferred, Multilac Uber cool (Comfort lifestyle), is an exterior paint that promises a cooler environment by reducing the interior temperature by up-to 5oc and helps to save energy. Multilac Platinum Shimmer (Dazzle lifestyle) can transform your home into a palace. If you are looking for an aura of royalty, the elegant shimmer is simply graceful, creating unlimited moods according to your lighting. Multilac Couture (fashion lifestyle) brings trendy and colourful effects and designs to your home, using the painting tools of your choice and making all the difference. Let Couture embrace your walls with true fashion and colours. Multilac Aqua Gloss (Eco lifestyle) replaces the traditional solvent based enamel paint with water based technology, without compromising on gloss level.